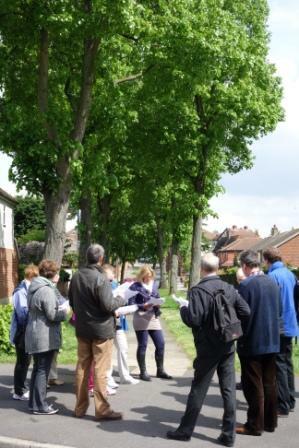 On 25 May 2013 Roger Mayo gave a guided walk to members of the Bexley Historical Society. 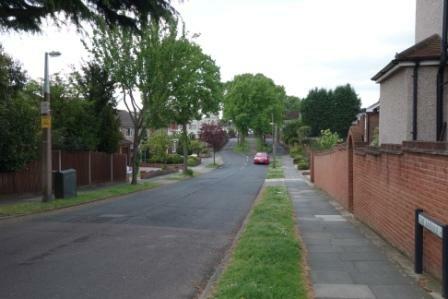 Starting at Blendon Parade, we saw the West Lodge of the estate (which still stands), moving on to see the site of the former Hall and its lake. Looking at the 1930s trees of The Avenue, which replaced an older line of trees. Seeing the contours of the landscape brought the estate’s former grounds to life, and we imagined views across to the Hall which once stood here. 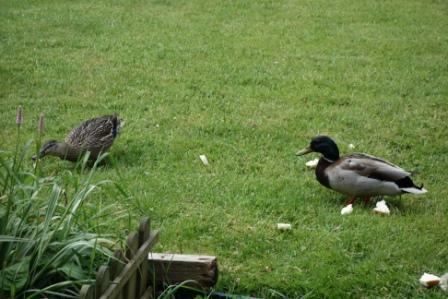 We were joined by some ducks, just to remind us that a lake used to be situated here! Roger delighted us with tales of gardeners falling over on discovering a remnant of the Hall’s cellars, of a horse called Karl buried in someone’s back garden (formerly the pet cemetery), and the enthusiasm of local residents in being a part of this living history. We imagined the Roman and Neolithic people who once lived in this area, as evidenced by artefacts found during archaeological digs. Roger also described the discovery of the underground tunnel and the quest for the Elizabethan house. 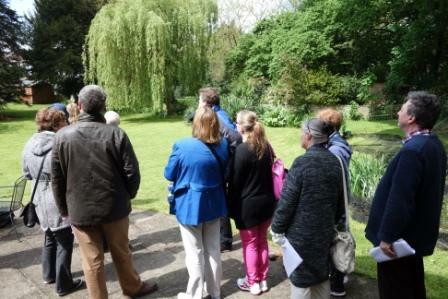 We also visited a private garden in The Sanctuary which lies where the lake used to be.